I’m going to be right up front here. I have ulterior motives in publishing this recipe and detailed instructions. 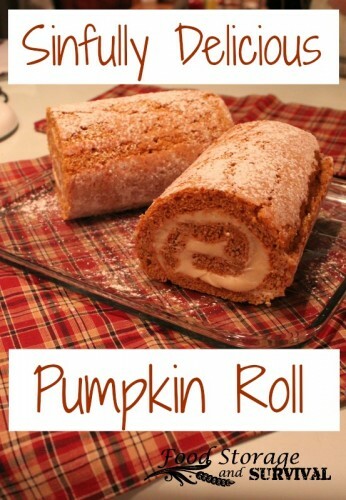 I have pumpkin roll for my birthday each year, but nobody in the house knows how to make it except me. So every year I end up making my own birthday cake. Well, this year, I had my daughters helping and taking pictures through the process and the plan is to have this post so self-explanatory that they can make it for me next birthday! Good plan, right? By covering every step in detail, you should be able to make it as well! 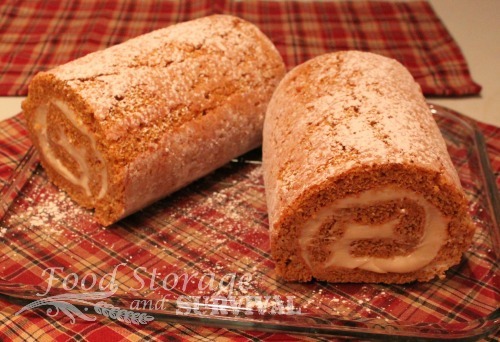 The combination of pumpkin cake and cream cheese frosting filling is so delicious, in our family, we call it sinfully delicious. It shouldn’t even be legal to eat this stuff it’s so good. 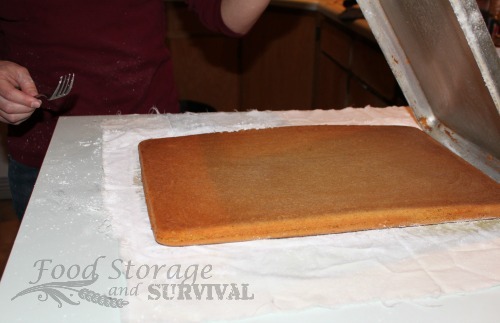 I am using a large commercial sheet cake pan (21″ x 15″). 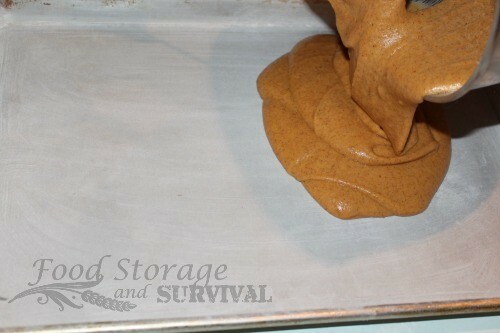 If you have a standard size cookie sheet, I’ve put an adjusted (2/3 size) recipe at the bottom of this post you can use. It will be smaller and the cake will be a bit thinner, but it’s still delicious. This size really feeds a crowd (or large family). 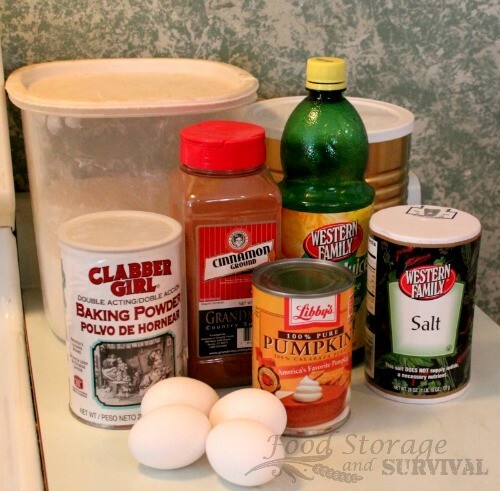 Cream the eggs, pumpkin, sugar, and lemon. 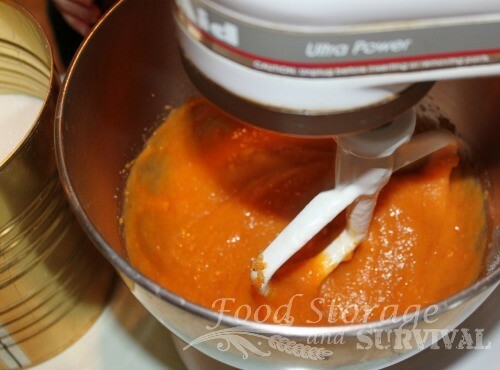 I’m using my Kitchenaid mixer to make it super easy. Thoroughly grease and flour your pan. This cake works way better if it falls right out of the pan and doesn’t stick. Start with a good layer of shortening. Make sure you get the corners and edges also and not just the bottom. 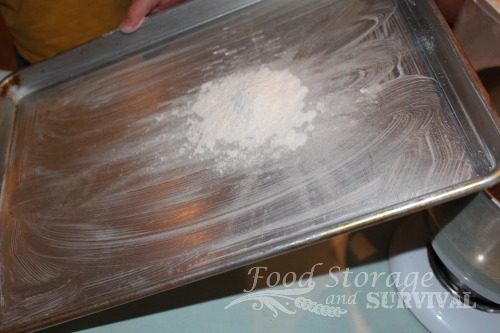 Then put some flour on the pan, tipping and tapping the pan until the flour has coated all the shortening. 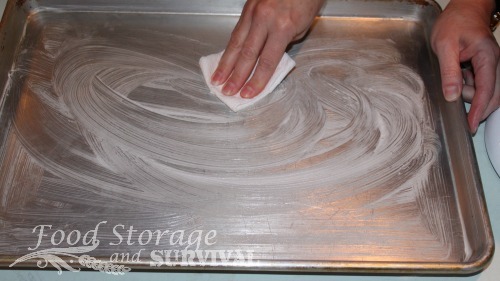 I usually do this over the sink to make cleanup easier. 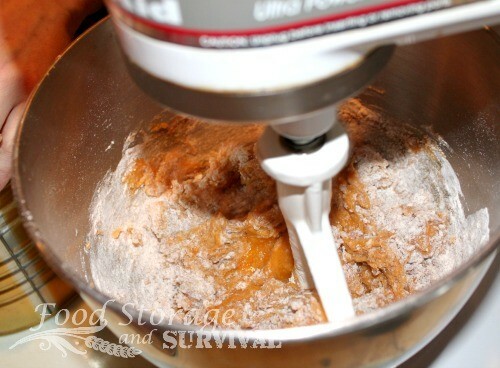 Dump out any excess flour, and your pan is ready. Smooth it out as best you can so it’s the same thickness everywhere. 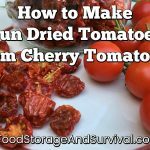 Put it in your preheated oven and bake 20-22 minutes or until done in the center. You want it thoroughly cooked so it doesn’t get gummy when it’s rolled up, but not over cooked as that causes the edges to crack when you try to roll them. While the cake is baking, prep the dump surface. I’ve heard of some folks using parchment paper here, but I do it the way my mom taught me. 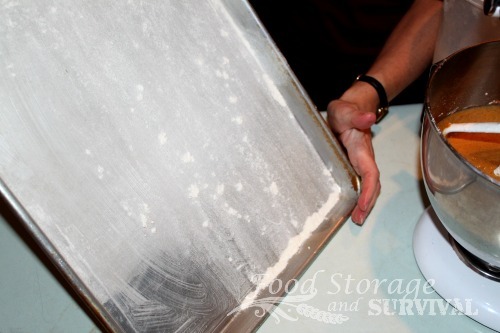 Lay a thin dish towel on the counter that is larger than your cake pan. I have a piece of muslin fabric that I use just for projects like this. 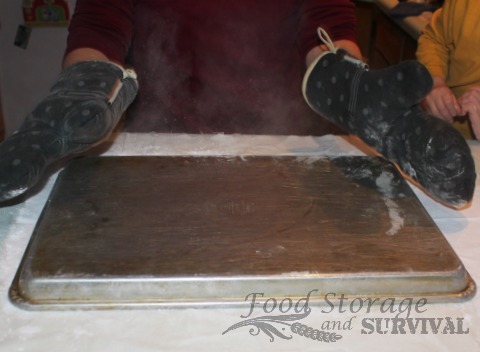 Coat an area the size of the cake pan with powdered sugar. You could just sprinkle it on, but I find it works better if it is thoroughly coated. 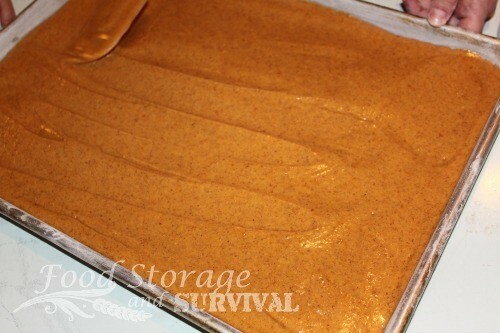 I dump some in the middle and spread it with my hands until the surface feels smooth. It’s probably about 1/3 cup sugar and there’s usually some that doesn’t get used so I save it for when the cake comes out. When the cake is done, you can let it cool in the pan for a few minutes, but not many. You want to get it out of the pan and rolled up while it’s still nice and warm. This helps with cracking issues as well as getting it out of the pan without sticking. If you think the cake is going to stick to the pan, get a large spatula and loosen it from the pan so it will all come out in one piece. 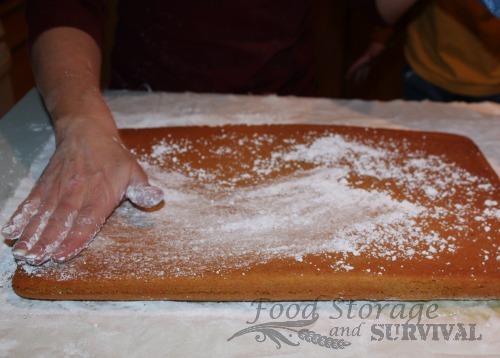 To get the cake out, quickly flop the pan over onto the powdered sugar towel. Yes, it makes a powdered sugar cloud. It’s worth it. Lift one side of the pan (I use a fork) and the pan should come off cleanly, leaving the cake on the towel. 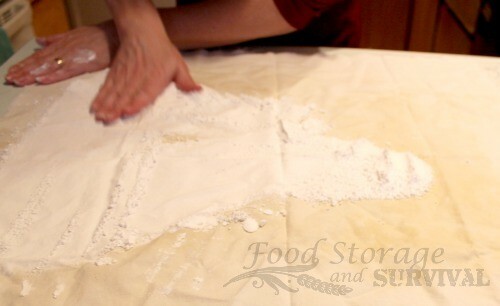 Sprinkle the top of the cake with powdered sugar (this helps it not stick to the towel). 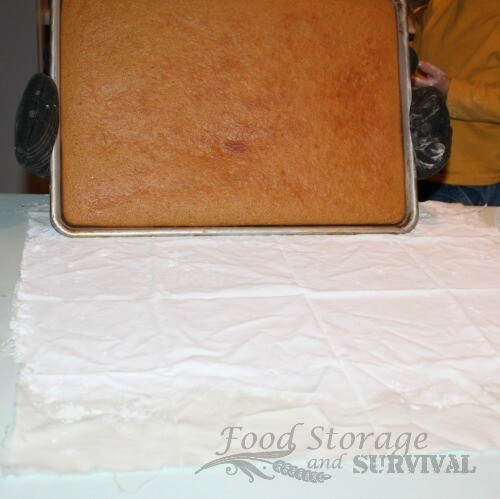 Loosely roll the hot/warm cake up, keeping the towel with it to separate the layers. 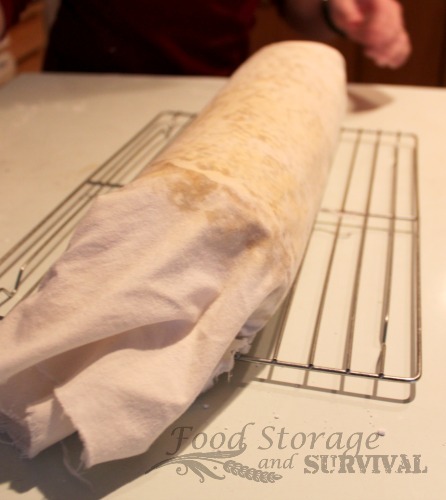 When it’s rolled up, set the whole thing on a cooling rack and let it cool. This will take a little while. If I’m in a hurry I’ll take it outside and set it in my barbeque. My birthday is in the winter, so outside is colder and the grill protects the cake from the animals. 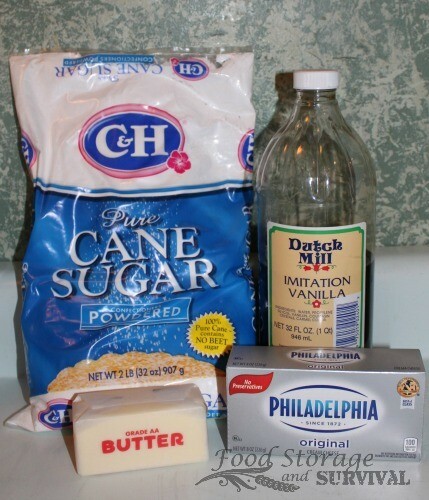 Cut the cream cheese in pieces and combine the cream cheese, melted or softened butter, powdered sugar, and vanilla and mix. Again, I’m using my Kitchenaid. Add a few drops of milk if needed to thin it out a bit. I almost never add the milk. 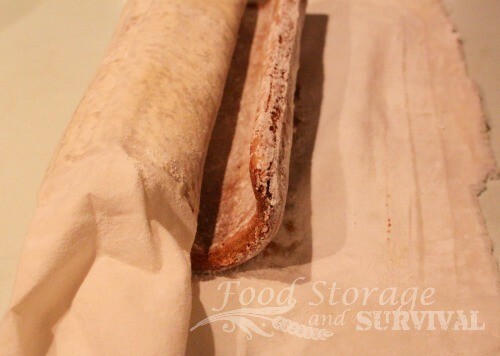 When the cake is cool, unroll it carefully. See how it wants to stay rolled? You may get some cracks when you unroll it. That’s okay–they’ll patch up with the frosting. 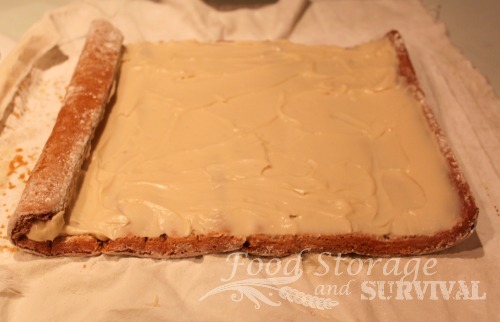 Spread on the filling, squishing it up under the first curve and spreading to the edges. 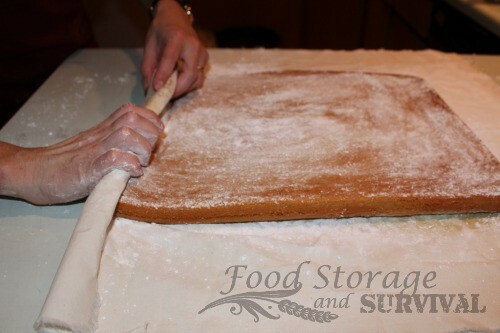 It’s okay to go slightly thinner at the edges as it will kind of squish when you roll it back up. Gently roll the whole thing back up (leaving out the towel this time!). Now, I know you’re ready to take a slice of that pumpkin roll right now, but don’t do it just yet. 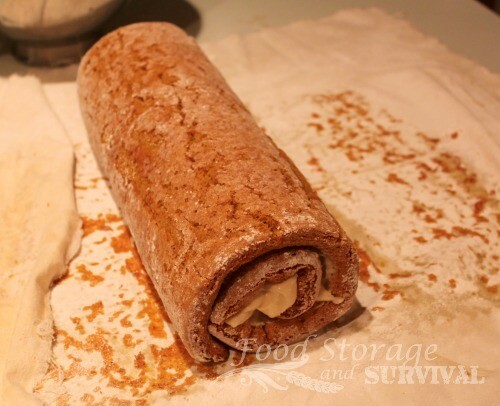 That squishy filling will squish all over and it won’t hold its pretty roll shape. 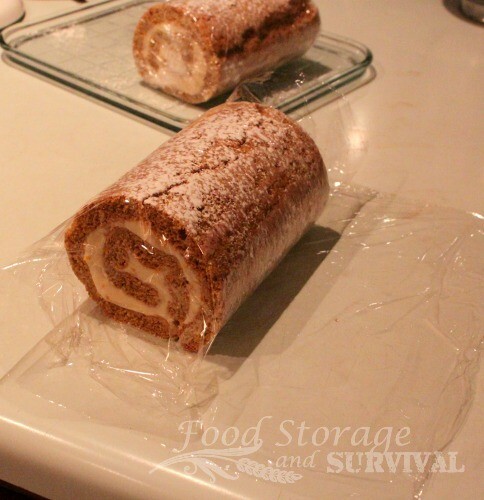 Just wrap it snug in plastic wrap to hold its shape and refrigerate it for a few hours. Between 3 and 8 hours should be fine. I actually cut this roll in half before wrapping to make it fit in my fridge and on my platter better, but you can leave yours long if you want. Once it has been thoroughly chilled, it is ready to serve! Unwrap the roll, place it on a serving tray, and dust with powdered sugar if desired to make it look nice. Slice and serve on plates. Yum. 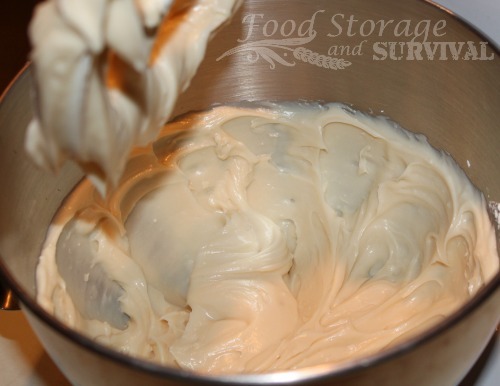 It’s only about half food storage friendly. Cream cheese, butter, and eggs are fresh (eggs could easily be substituted with powdered eggs), and the rest comes from the cupboard. I made a pumpkin cake roll and I’m wondering about storage. Should I keep it in the refrigerator in between servings? I must admit I need a quick reply. Thanks so much! Yes, any uneaten portion should be refrigerated.